At Dermalure, we understand that everyone’s skin type if different. That is why we offer chemical treatments and other skincare products in varying types so that everyone can use our products to restore and rejuvenate the natural glow of their skin. Use this guide to take a moment to find out what skin type you have so you choose the correct chemical treatment. Wash Your Face. Using a gentle cleanser, wash your face and then pat dry. This will wash away the dirt and oils that have accumulated on your skin. Wait One Hour. During this time, you skin will return to its natural state which will help you determine your skin type. Do not touch your face during this time. Dab Your Face with a Tissue. When dabbing your face with a tissue, focus on the T-zone which is the area of your forehead and nose. Determine Your Skin Type. The four main skin types are normal, oily, dry and combination skin. Normal skin is neither oily or flaky and it feels smooth and supple. If you have this skin type, the tissue you used to dab your skin will not show any flakes or oily spots. People with normal skin can benefit from a Jessner peel that contains chemicals designed to exfoliate the epidermis to leave clear, even and smooth skin underneath. Oily skin will show on the tissue you use as grease. People with this skin type typically have large pores and shiny skin. A Dermalure Hybrid Peel is ideal to use on oily skin as it both unclogs pores and reduces their appearance. A salicylic acid peel is another good choice for oily skin as salicylic acid gets rid of bacteria, surplus sebum and inflammation from deep inside the pores. Dry skin may feel tight or show flakes of dead skin. People with dry skin typically have small pores. Lactic acid chemical peels are good for those with this skin type as lactic acid can provide the necessary hydration dry skin needs. Combination skin is the most common skin type. This skin type exhibits traits of all three of the above skin types. 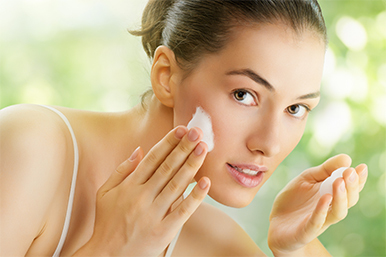 In this skin type, the T-zone is usually oily while the skin elsewhere is dry. People with combination skin can benefit from glycolic acid peels that deep cleans pores and smooth rough skin while leaving the skin soft and supple. It’s always best to begin with a lower strength acid when choosing a chemical treatment. This is because chemical treatments with stronger acids remove more layers of the skin. When you begin with a chemical peel featuring a milder acid, no more of the top skin than necessary will be peeled away. The skincare experts at Dermalure strongly recommend consulting with your dermatologist before choosing a chemical skincare treatment as he or she can tell you what level of acid is right for your particular skin type.